Each plant will produce up to 3lbs of fruit per season for 5 years - up to 9lbs in total this summer! Very easy to grow and winter hardy too! Supplied as 3 established plants in 9cm pots, you'll save a fortune compared to supermarket prices! This brand-new type of strawberry is already taking leading restaurants by storm because of its exceptional, delicious tropical flavour, and now you can grow it at home! The attractive fruit creates a flavour explosion as soon as you place it in your mouth first you taste strawberry, then tropical flavours hit your palette whilst all the time a cloud of mouth-watering aroma builds! It really will create a taste sensation. Pineberry's juicy fruits have a more intense flavour than red strawberries, with a subtle aftertaste of pineapple - hence it's name. Its unusual colouring is quite striking too. 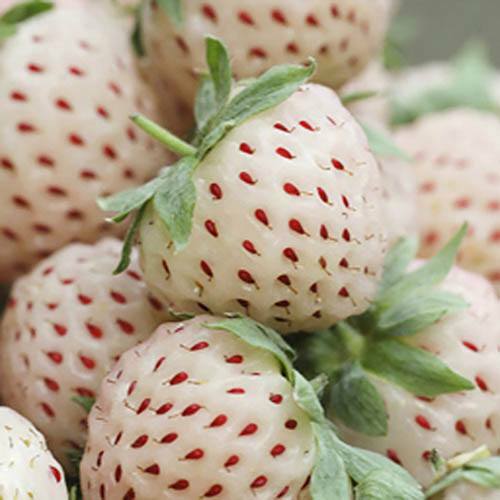 With its creamy white flesh and red seed pips Pineberry looks like a normal red strawberry but in reverse! So far this highly distinctive fruit has only been sold in a few select Waitrose stores in the UK and at up to £14 per pound! Still not easy to find in garden centres across the UK, you could be one of the first to grow your very own crop of these incredible berries. Simply grow like ordinary strawberries - crops a little earlier in June. Supplied as 3 established plants in 9cm pots. Grow them as you would normal strawberries - they'll crop a little earlier in June each year. Remove any runners frm the plants as they form, this will prevent the plant's energy being diverted away from fruit production. Strawberries should be planted out as soon as possible - only plant outdoors once all risk of frost has gone. Plant in a sunny and sheltered position in fertile, free-draining soil. Poor soil can be improved by adding compost or well-rotted manure prior to planting. Give your strawberries plenty of space. Dig a hole with a trowel big enough to take the roots of the plant. Plant them 45cm (18in) apart, leaving 75cm (30in) between rows - the crown should be level with the soil surface. If you plant strawberries too deep, they might rot, but if you leave the crown protruding from the soil, the plant will dry out and die. Firm your plants in well and water thoroughly. If you're planting into a basket, it's best to limit yourself to three or four strawberry plants in a 30cm (12in) basket. Add water-retaining granules and slow-release fertiliser into the compost before planting. Check the compost daily in hot weather – water if the top half-inch of compost feels dry. If growing strawberries in pots or hanging baskets, feed them every two weeks during the growing season with a balanced fertiliser. When flowering begins, switch to a high-potash liquid fertiliser to encourage good fruiting. As the fruits develop, place dry straw or mulching fabric underneath to stop splashes blemishing the fruit. After cropping, remove any straw and netting to allow better air flow around the crown of the plant. As the summer progresses, keep on top of weeding and continue to remove any runners. Clear away dead foliage as this can harbour pests and diseases over winter. Each spring spread a general-purpose fertiliser around your plants along with a mulch of well-rotted manure or compost.